Thanks to this shirt, anyone can get their first glimpse of a true zombie horde with a fair amount of safety. 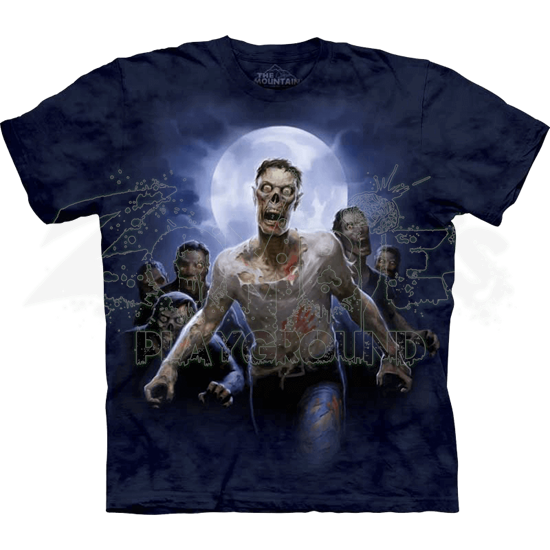 In addition, there is also something catchy about zombies that just makes this Zombie Horde T-Shirt a great garment to wear. It depicts a horde of zombies as they advance, lit by the dull glow of a full moon. The lead zombie possesses a grey pallor and tattered clothing stained with the blood of previous meals. Alongside this lead zombie are countless others, all faded into the background to make it seem like there are infinitely more that might be coming out of the darkness. The shirts dark blue coloration blends well with the print, making the whole shirt seem as though it is one large design of clouds and mists from which the zombies emerge. The shirt itself is constructed from durable, 100 percent heavyweight cotton, while also featuring a relaxed fit, which makes it incredibly comfortable to wear. It also features reinforced double stitching on all the seams and comes pre-washed and pre-shrunk, ensuring that it is ready to wear the moment you get it. The best part is that the shirt is dyed with a unique process that actually pulls the dye out of the fabric while leaving the coloration behind, essentially dying the cotton with the ink! The end result is that the print blends seamlessly with the shirt, creating a stunning garment that will be the envy of all who see it! For zombie fans, this Zombie Horde T-Shirt is an absolute must-have, possessing an attractive and stunning design as well as a comfortable fit that makes it a great choice to wear on any day of the week!